Macedonia may be one of the easiest places in the world to do business (ranked 12th by the World Bank), but only if there are good opportunities. Over half (52.1%) of business owners start out of necessity, rather than out of opportunity. However, the country’s falling jobless rate (from 38% in 2006 to 24.6% by February 2016) offers some hope. SME employment and value-add is steadily growing, having increased by 14% and 9% respectively between 2008 and 2013. However, the productivity of SMEs in Macedonia is 80% below that of the EU average. Although Macedonia has less red tape and better access to finance than most other Balkan countries, firms perform poorly in terms of skills and innovation (0,44% GDP invested in R&D in 2013), while few do business outside its borders. A recent drive to introduce entrepreneurship in schools means that today all students in both primary and secondary schools are involved in entrepreneurship education. Previously, only those that attended special economic schools were included. The drive is linked to a move in 2006 when the Macedonian government began launching a number of initiatives to support SMEs. Among these has been the adoption of a national strategy for innovation and introduction of courses related to innovation and entrepreneurship for primary and secondary education. Following the failure of early attempts in 2007 to introduce entrepreneurship training for secondary school learners (not enough teacher training and/or suitable textbooks were provided), the first two-day teacher training course was carried out by the Macedonia’s Bureau for Development of Education (BDE) and the Business Start-Up Centre (UKIMBSC). A textbook was also developed by the former. This was followed by the introduction in 2007 of the first national business plan competition among secondary schools (which since 2012 has been sponsored by the Prime Minister of the Republic of Macedonia). In 2013 six regular courses in 9th grade for physics, chemistry, biology, informatics, art and mathematics were revised to include topics in entrepreneurship and two days of training for 300 primary school teachers were provided. In 2014, with support from the European Training Foundation in 2014 the Government adopted National Strategy for Entrepreneurial Learning 2014-2020 together with an action plan that lays out the redesign of five curricula for courses. The Strategy aims to nurture an entrepreneurial mindset among youth which can help them find a job, take the initiative in their life and start a business if they wish to. Each year of the five-year innovation and entrepreneurship course has a particular aim. For example, in the first year students are asked to design an event that showcases the economic opportunities they have discovered in Macedonia and beyond. In the second year of secondary school the students develop a business project that connects with global economic opportunities that they have discovered, while in the final year the students are required to apply all of their prior learning to developing a company. The new courses have been implemented since September 2015. New textbooks were prepared, while training for 1,500 to 2,000 teachers from primary and secondary schools, related to the new programmes, started in June 2015 and ended in October 2015. The team that worked on the redesign of curricula also developed two guides : one for teachers and professors on how to teach entrepreneurship and another for school administrators and educational authorities on how to create an entrepreneurial school. More than 2,000 teachers from all primary and secondary schools in the country will undergo 2 to 5 days of training on topics related to innovation and entrepreneurship in 2016 and 2017. Initially, the initiative encountered numerous challenges related to insufficient financial allocation, which meant schools often had to apply for additional monetary resources. This together with lack of appropriate textbooks and training materials, resulted in difficulties and delays in the beginning. In addition, the teacher training was initially not appropriately defined in terms of content and duration by relevant governmental institutions. However, with reviews held every two years, the problems were detected early on and potential defects could be fixed. To enable teachers and professors of entrepreneurship in schools and universities to share experiences and best practices, the National Centre for Development of Innovation and Entrepreneurial Learning in 2011 established the National Entrepreneurship Educator Network (NEEN). The network began with 150 members and an inaugural meeting was organised under the auspice of the president of the country, with support of the Ministers for Economy and for Education and Science. The state now aims to strengthen NEEN by developing online tools and resources to help teachers and students and facilitating international networking to enable teachers and students to communicate with peers from other countries and share resources, good practices and other materials. In the first evaluation, conducted in 2009, only 40% of students, teachers and professors, and principals and administration staff from primary and secondary schools supported the initiative. However, by the second evaluation (2012) 70% of participants were in favour of the programme. Moreover, the initial governmental support was significantly lower at the beginning, due to the state’s uncertainty of the initiative’s success. At present, the initiative is wholly supported by the government, which has expanded its funding allocation. Community stakeholders have also reacted positively to the initiative. Since 2014 the Ministry of Education and Science has been developing a database of entrepreneurs that would be willing to be guest speakers or to host study visits. 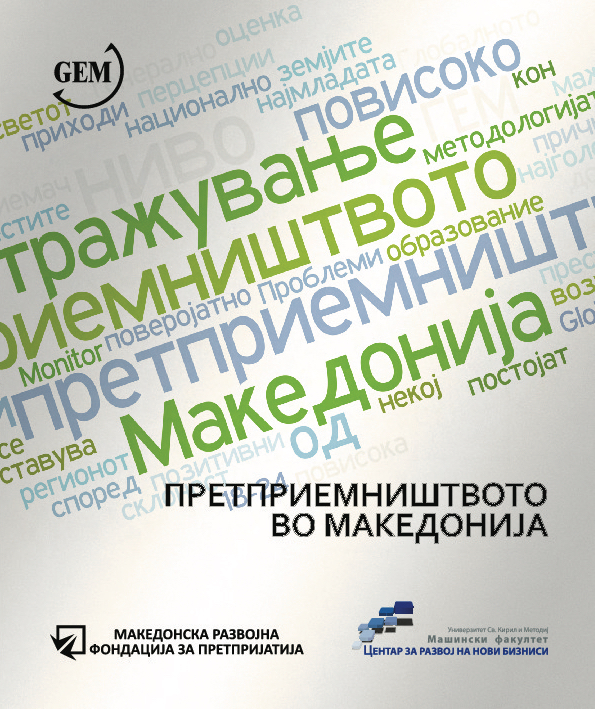 Recently (January 2016), the Ministry of Local Self-development started development of regional innovative strategies based on smart specialisation in all eight Macedonian planning regions. Significant number of activities is planned towards strengthening entrepreneurial learning at the local (municipality) and regional level, and this should give an additional boost for strengthening local ecosystems in Macedonia. It’s still too early to ascertain what effect, if any, entrepreneurship education at schools will have on the country’s overall rate and quality of entrepreneurs. Although it could take decades before a clear impact is shown, but Macedonia is boldly attempting to ratchet up support for entrepreneurs. Integral to its success has been the Macedonian government, which together with non-governmental institutions, university bodies and international and national donors, helped drive the programme. In 2013, the Global Entrepreneurship Monitor (GEM) was conducted in Macedonia for the fourth time, based on the methodology of Babson College and London Business School. It included a telephone survey with 2.000 respondents aged 18 to 64, measuring their perceptions and attitudes towards entrepreneurship, their entrepreneurial activities and aspirations. In addition, 37 national experts were interviewed, contributing to the analyses on the framework conditions for entrepreneurship. This report presents the trends in relevant indicators for Macedonia for 2008, 2010, 2012 and 2013, including comparative analysis with the countries of the region: Bosnia and Hercegovina, Croatia, Slovenia and the average of the EU countries. The Entrepreneurial perceptions reflect the attitudes towards entrepreneurs and entrepreneurship, the opportunities of starting a business, possessing skills and experience, the intentions to start a business and other indicators. Every third respondent believes that there are good opportunities to start a business in the next 6 months. More than half of the respondents consider that they have the required knowledge to starting up a business. In general, in Macedonia there are positive attitudes regarding entrepreneurship as a career option, people consider that the entrepreneurs enjoy a high status in the society and consider that there is enough media attention for the entrepreneurship. Compared to the countries in the region and the average of the EU countries, in Macedonia, most of the respondents (37.2%) think that there are good opportunities of starting up a new business, most of them (29.1%) plan on starting their own business in the next 3 years, and 69.5% consider that entrepreneurship is a good option for career. The section for entrepreneurial activity examines to which degree people undertake new business activities, and why do they stop doing business. The entrepreneurial activity is measured through the key index TEA (Total Early-stage Entrepreneurial Activity). TEA index in 2013 in Macedonia is 6.63%, where 3.35% are nascent entrepreneurs, (those who have business activities approximately up to 3 months), and 3,53% are new (those who have business activities up to 3,5 years). GEM analyses the characteristics of the entrepreneurship in the early stage and makes a difference between necessity-driven and opportunity-driven entrepreneurship. In Macedonia in 2013 most entrepreneurs are driven by necessity (60,98%), and 22.95% said that they are motivated by the perceived opportunities. Unlike Macedonia, in Slovenia, Croatia and the countries of EU, the entrepreneurs in the early stage are much more motivated from the perceived opportunities than necessity. 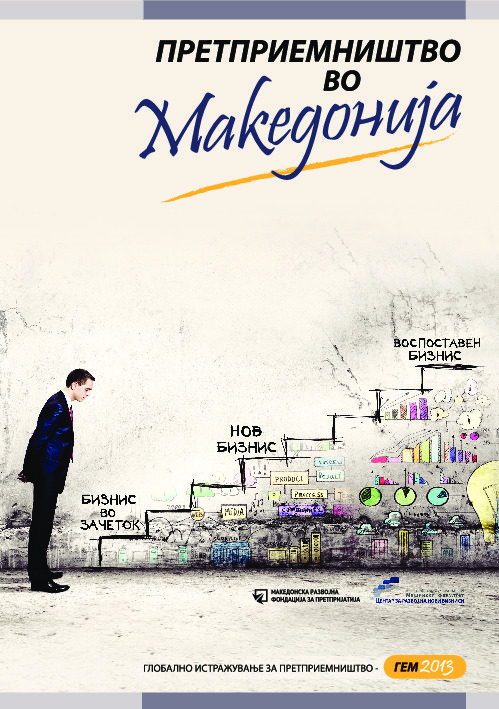 In Macedonia most of the entrepreneurs are men, aged 25 to 34, with a higher level of education and income. In 2013, 7.29% of the respondents said that they are owners or managers of already established businesses (with business activities over 3,5 years). The main reason for business discontinuation this year is the unprofitable business and the problem with the access to finance. Entrepreneurial aspirations describe the qualitative nature of the entrepreneurial activities through examination of the aspirations for growth, innovation and towards the external market. In Macedonia 59% of the entrepreneurs in the early stage expect to employ up to 5 people in the next 5 years, 23% expect to employ from 6 to 19 people, and 18% expect to employ more than 20 people. In 2013 the innovation rate in Macedonia is 13.82% in TEA businesses, and 4.23% in the established businesses. In Macedonia most of the enterprises in the early stage have responded they have 1% to 25% of foreign costumers, which defines their aspiration towards the external markets. Furthermore, the GEM report includes analyses on the Entrepreneurial Framework Conditions, through the survey conducted with national experts. These analysis gives an insight into the ways these nine areas support or limit the development of entrepreneurial activities. Those areas are: finance, government policies, government entrepreneurship programmes, entrepreneurial education and training, R&D Transfer, internal market openness, physical infrastructure for entrepreneurship, commercial and legal infrastructure for entrepreneurship, cultural/social norms. For third time in a row, Global Entrepreneurship Monitor (GEM) was implemented in Macedonia, according to the established methodology of Babson College and London School of Business. The survey encompassed a telephone survey of 2,003 respondents aged 18-64, aiming to explore their perceptions and stances on entrepreneurship. Additionally, 30 national experts were surveyed in order to contribute to the contextual analysis for entrepreneurship promotion. Entrepreneurial perceptions reflect attitudes towards entrepreneurs and entrepreneurship, opportunities and risks for starting business, possessing skills and experience, as well as other indicators. Almost every third respondent feels that there will be in the next 6 months good opportunities for starting business, whereas every second respondent is of opinion that he/she has the required knowledge and skills for starting business. According to the last indicator, Macedonia is a leader compared to other countries in the region and the EU. 39% from the respondents which feel that there will be in the next 6 months good opportunities for starting business, list fear of failure as a reason for preventing them from starting business. On the other hand, 28% from them would start business in the next 3 years. More than 70% feel that entrepreneurship is preferable career option whereas 67% feel that entrepreneurs enjoy high status in the society. Compared to 2008, when the first survey GEM was performed in Macedonia, the last two indicators register decline of 10 and 5 percent points, respectively. The section on entrepreneurial activity examines to which degree do people undertake new business activities, as well as why they quit the business. The entrepreneurial activity is measured through the main index TEA (Total Early-stage Entrepreneurial Activity). This index stands at 6.97% for 2012. It is comprised of 3.73% of nascent entrepreneurs (those who have business activities up to 3 months) and 3.24% of new entrepreneurs (with business activities up to 3.5 years). This index is in line with the indices of other countries in the region, as well as the unweighted EU average. GEM makes distinction between entrepreneurship motivated by opportunity and necessity. In Macedonia, 52% from the entrepreneurs have stated that they are motivated by necessity, whereas 29% are motivated by opportunity. In 2012, as well as in the previous surveys, the profile of the typical entrepreneur is male, aged 25-34, with higher education and higher income level. On a similar level as the TEA Index, 6.73% from the respondents declared to be owners or managers of already established businesses (with business operations exceeding 3.5 years). This year as well, for most commonly mentioned reasons for ending business activities are: unprofitability of the business and financing problems. The entrepreneurial aspirations provide qualitative nature of the entrepreneurial activity through examining the growth aspirations, orientations towards innovation and towards external market. In Macedonia, 60% from entrepreneurs in early stage expect to employ up to 5 persons in the next 5 years, whereas 12% expect to employ up to 20 persons. At the same time, 20% from the early-stage entrepreneurs have aspirations towards innovation, while 26% are exposed to external markets for sale of their products and services. Additionally, the GEM report includes an analysis of the environment for entrepreneurship support, through surveying national experts. This analysis provides insight into the 9 defined areas that either support or limit the development of the entrepreneurial activities. These areas are: finance, government policies, government programmes, entrepreneurial education and training, transfer of research and development, commercial and legal infrastructure, openness of domestic market, physical infrastructure and cultural/social norms.